When it comes to safety in the home, bathrooms haven’t got the best reputation – all that water everywhere which, if not kept clean and dry, could mean someone ends up slipping and getting hurt. These days there are plenty of anti-slip bathroom accessories you can add to your bathroom to keep it as safe as possible. Anti-slip bathroom accessories are essential additions to bathrooms which are frequently used by children or elderly members of your household. 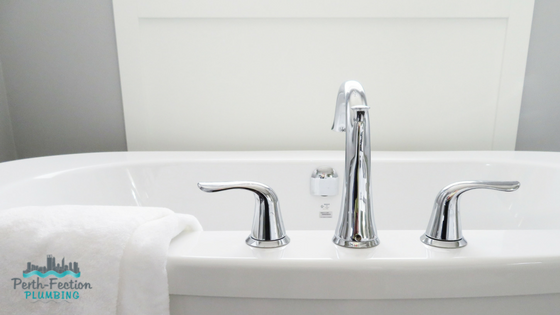 Here are 5 anti-slip bathroom accessories our plumbers in Perth recommend for a safer bathroom. One of the most common ways to make your bathroom safer is to add anti-slip mats. These usually go inside your bath or on the floor of your shower to help give more grip in slippery areas. You can pick these up at stores like Bunnings, K-mart, Target and BigW. These days you can even get anti-slip bathroom mats which have indicators that show if the water is too hot for your child, which will reduce the chance of scalding as well. An alternative if you don’t want a full bathroom mat is to add anti-slip stickers to your bath or shower. These come in all sorts of colours and shapes for kids, making bath time not only safe, but more fun too. If animal shaped stickers aren’t your thing, you can go for something more understated like anti-slip strips, which are usually white long strip stickers that blend in with your shower or bath. Did you know that your choice of tile will affect how slippery your bathroom surface is? The smoother and shinier the tile, the more likely it will be to become slippery and potentially dangerous. By opting for a textured tile or smaller mosaic style tiles, you can naturally create some grip on the surface itself. If you love your tiles but recognise they may pose a safety issue, you can consider applying an anti-slip tile treatment to them. There are several brands on the market, and they work to create extra grip on slippery bathroom floors. These treatments do need to be applied correctly in order to be effective, so if you aren’t confident in using the product, speak to our Perth plumbers today and they can do it for you. Anti-slip bathroom tapes are ideal for bathrooms where maximum grip is needed. You can get ones with soft touch surfaces making it easier on bare feet. It can be coloured or clear, so you can choose what will fit best in your bathroom. Clear tape is usually a popular choice as then it blends in with the rest of the surface and makes it almost invisible. If you’d prefer to leave it to the professionals to make your bathroom safer, call our plumbers in Perth today. We cover everywhere from south of the river to Joondalup and our plumbers are all qualified and licensed, meaning you can trust us to do a great job. Call us on 0451 781 384 or get a free quote online now.